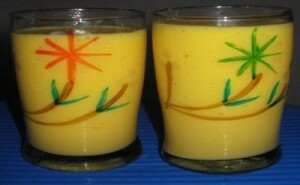 Mango Milk Shake recipe by MuskanKhan85 at PakiRecipes.com. Place mango pulp, vanilla extract and 1 cup milk into a blender and blend until smooth. Add vanilla ice cream, with the motor running, add remaining milk and blend, until it is thoroughly mixed. Pour the shake into the glasses with a straw. Serve immediately. I'm a Pakistani and Mango Shakes are awesome! !